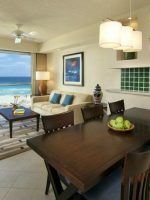 As soon as you enter the lobby of the Beach Palace, see the red leather banquette in front of the large aquarium and notice the Mexican modern art on the walls, you realize this is a classy resort. 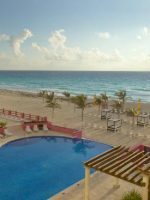 One of four Palace resorts in the Cancun region, Beach Palace has an intimate, upscale appeal that caters to every whim of families on vacation. Forty-nine of the 287 rooms are Family Suites — adjoining rooms complete with an indoor hot tub and large balcony space. Twenty of those rooms come with nanny service, so you and your loved one can slip away for three hours of babysitting each night. Even when you’re apart, walkie-talkies are handed out to each family, so parents can contact their kids when they’re playing at the Connection Zone Kids Club. 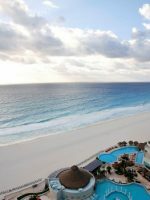 Yet, this being Cancun, the real appeal is that exquisite stretch of beach the aptly named Beach Palace is planted upon. The white sands lead to the lulling waves. 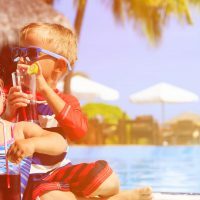 If your children prefer pools to ocean water, you’ll be happy to know the resort features three pools with swim-up bars and a kiddie pool and water slide at the kids club. 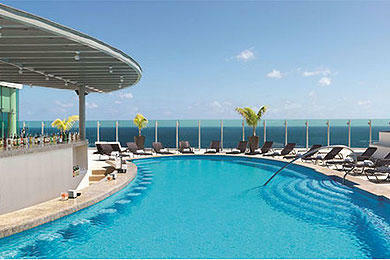 Two of those pools are on the 14th floor rooftop overlooking the ocean and lagoon. This gives guests a rare opportunity to see the sun set over the lagoon in the west. If you’re wise, you’ll return every day to see the sun’s red glow melt into the waters as you sip another frozen margarita. If you can tear yourself away from the water, numerous activities beckon. Two Jack Nicklaus-designed golf courses are nearby. A complimentary shuttle takes people to and from the Wet n’ Wild Water Park every day. The resort is only a five-minute walk to La Isla Shopping Village Mall, one of the best malls in Cancun. 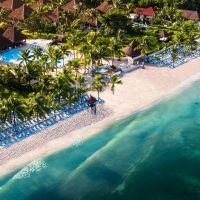 Then there are the numerous day trip opportunities to visit the Mayan ruins of Tulum, snorkel off Isla Mujeres, swim with dolphins, fish for marlin, scuba dive on the reef and relax on a sunset cruise. If you need a good dose of sunshine and warmth, it’s hard to go wrong with Cancun. Kids are greeted with a welcome kid of bathrobes and slippers, chocolate milk, candies and cookies, L'Oreal bubble bath and a selection of beach toys. The Family Suites feature an xBox with the flat-screen television and an extensive menu of video games and movies suitable to children. The master bedroom features a king-sized bed, large indoor Jacuzzi tub, a countertop bar and espresso machine, mini-fridge, living room area with sofas and a spacious balcony with cushiony outdoor lounge chairs. The adjoining kids room features two double beds, a second Jacuzzi, mini-fridge, flat-screen television and, similar to the master bathroom, a shower with a rainforest showerhead. Other amenities include a safe, ironing board and hairdryer. Expect Oreos and chocolate milk to arrive during turndown service. Two connecting Superior Deluxe rooms combine to form the Family Deluxe Suite. 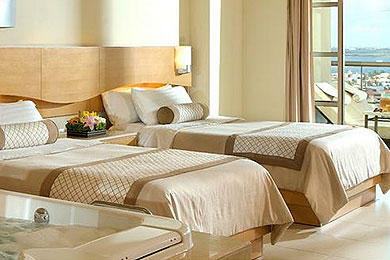 To save money, simply rent one of these Superior Deluxe rooms, which can come with two double beds. 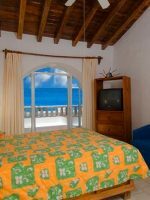 You have the option of renting a room with ocean or lagoon views. If you want to watch the sunset every night from your balcony, choose a Superior Deluxe room with a lagoon view. Even more affordable is the Deluxe Resort View, which has less of a sitting area and balcony space compared to the Superior Deluxe room. There is a Asia restaurant in beach palace. They celebrate my daughter’s sixth years birthday party. The chef Roberto made a special dishes for us. We really appreciate everyone help us to celebrate our daughter’s birthday. That is a perfect day for us. The special dishes are super yummy. We highly recommend this hotel. Everyone is super kind and nice. We love it so much. Thanks for everyone give us a unforgettable night. Roger great service on the beach waiter. Diamonds service. Thank you for the doubles Piña. Adayir pool concierge , great help. Excellent guy! Armando, the entertainer and great magician. The whole package. Great trio. We love this place! These gentlemen made our staying magical! Palace resorts are known for their kids clubs, and the Beach Palace's "Connection Zone" doesn't disappoint. 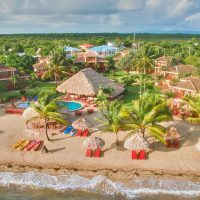 Available to all children ages 4 to 12, guided activities include treasure hunts, beach soccer, pita-making, Spanish lessons, kiddie disco, cookie-making, pool games and face painting. More eco-conscious endeavors are also offered, like beach cleanup, tree planting and sea turtle releases during the summer season. Located next to the kiddie pool, the kids club also houses an arcade room and offers board games like Twister and Scrabble. Older children will enjoy the teenage disco at night and xBox 360 video game tournaments played on a giant screen. The kids club also features a special kids menu, consisting of mini burgers and French fries, pizza, grilled cheese sandwiches, chicken fingers, quesadillas, spaghetti and ice cream.Nextel walkie-talkies are handed out to all families at reception, so you won't have to chase down your child if you have to catch a bus to Tulum. There's daily entertainment around the main swimming pool that starts with yoga and water aerobics in the morning, leading to pool and beach volleyball, Zumba and a table tennis tournament throughout the day. Try the large water slide that lands with a splash. Depending on the day, there are special presentations, like a Mexican cooking class or how to make a mean margarita. When the sun starts to set, wander over to the rooftop pool to watch the daily light show. The entertainment continues in the evening with shows around the pool and in the Stadium Sports Bar. Depending on the night, you can be outside under the stars watching the Michael Jackson Revue, drums and fire and breakdance shows, or inside enjoying the casino or karaoke night. There are also pool tables located in the Sports Bar. Those seeking peace and quiet throw their towels down on the chaise lounge chairs at the beach. The beach extends for miles in either direction, offering the opportunity to take a long stroll later in the afternoon when things begin to cool down. If you're thinking of visiting the Mayan ruins, realize that it's a 90-minute to two-hour drive to Tulum each way. If you can stomach the long distance, you'll be treated to more than 50 structures that are thousands of years old. This includes El Castillo, the tallest building. Climb the steep stairs to reach the top and savor the vista of the surrounding beach and sea. 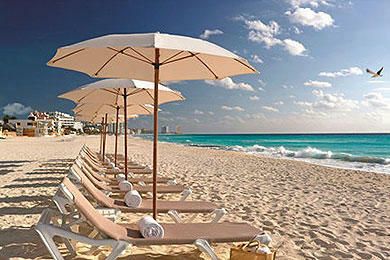 If you have time, go for a dip in the ocean before returning to Cancun. The gluttony of food starts with the breakfast at the Mexican restaurant, Tequila. The large buffet features fresh fruit like papaya, mangos, pineapple, bananas, cereals, yogurt, smoothies, eggs, omelets, bacon and sausage. 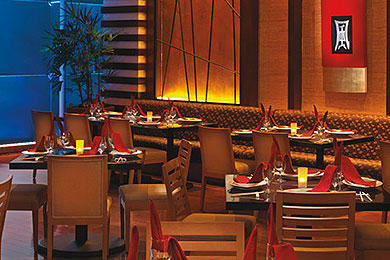 If you prefer to have waiter service in the morning, you can have breakfast at the Italian restaurant, Bocelli. Tequila and Bocelli are the two main restaurants at Beach Palace with food offered throughout the day. If your kids favor pasta and brick-oven pizza to quesadillas and guacamole, head to Bocelli for lunch. At dinner, Tequila offers steak and chicken fajitas, while Bocelli is better for seafood lovers, with fresh salmon and Fra Diavalo-type pasta dishes featuring calamari, shrimp and mussels. The resort's third restaurant, Wok, is a pan-Asian style steakhouse that offers a mix of Chinese, Japanese and Thai selections. So expect staples like sushi, pan-fried dumplings and pad thai, along with cuts of filet mignon and prime rib. There's a nice outdoor terrace connected to Bocelli, called La Terraza, that's a great place to relax. You can also head over to the pool snack bar for pizza, burgers and fries. The resort's other restaurant, Wok, is a pan-Asian style steakhouse that offers a mix of Chinese, Japanese and Thai selections. So expect staples like sushi, pan-fried dumplings and pad thai, along with cuts of filet mignon and prime rib. The Beach Palace also offers 24-hour room service, which is especially nice for breakfast on the balcony if you like to wake up slowly. It's also wonderful if you have young children who peter out after a long day of surf and sun. Gone are the days when each parent had to dine alone while someone stays in the room with the sleeping child. For those who opt for nanny service, you'll receive three hours of help each day for two kids ages 2 to 17. Additional time is available for an extra cost. This allows you and your loved one to play a round of golf or eat a romantic dinner in town. The concierge service, located off the lobby, offered great advice on which day trips are best suitable for families. Hit the fitness center on the top floor to work out on new ellipticals, treadmills and weight machines. Christmas week and the February/March school break time are the high-season weeks. Yes, you're guaranteed plenty of sunshine and temperatures in the low 80s, but expect to pay for that privilege. The shoulder season months of December and April are a great time to go because weather is ideal and there's far less congestion. 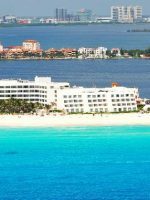 If you really want to keep it affordable, head to Cancun in the summer, but make sure to view the 10-day forecast before departing, because Cancun has been hit hard by hurricanes in the past. 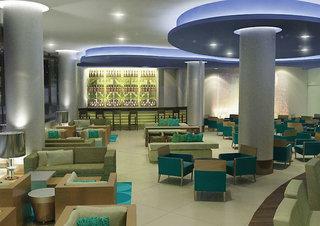 The Cancun International Airport is located about 20 minutes away from this resort. The resort is easily walkable. The spa, rated one of the best in the country by Conde Nast Traveler, features manicures and pedicures for women. The eight treatment rooms in the spa feature a Couples Suite, complete with your own shower for two and sitting areas. Select between the 90-minute "Romantic" couples massage or the ultra-sybaritic 190-minute "Passion" that includes a Chocolate Wrap, Aroma Therapeutic Massage and Refresher Facial. Kids, what kids? Hors d'oeuvres served during the sunset at the rooftop bar are a nice touch.